When I got up this morning I thought, 'WHY NOT STARTING WITH HAMLET, STARRING BENEDICT CUMBERBACH AT THE BARBICAN? Then I realised that I want to leave that post for another time, when I feel more confident in this new blogger world. So here I come with a fantastic play based on the novel by the same name: 1984 (by the talented and famous writer George Orwell). I'll try to answer some questions that could be of interest in case you're in London (the city by the Thames river, the 'land of dreams', the 'field of poetry', the grass where Shakespeare spread his ink with tender and passion) and you're thinking about watching it or you're not in the city yet but you'd like to spend a weekend as a Theatre Alcoholic. Why did I watch this play? When I go to a play, where I'll be spending two or more hours of my life, I always make this question to myself. Well, in this case, the answer is simple: my lovely and amazing host recommended it to me!!! That first day in London I was a little bit lost as there are so many places to go and things to do that I found hard to choose something interesting. Fortunately, my host, who has become a friend now and who encouraged me to start with this blog, was right. THE PLAY IS SUPERB!!! So, as a conclusion, I bought a ticket for 1984 because someone recommended it to me. It's something that happens sometimes and it can be worth it. In this case it really was...!!! What to do in other cases? Of course, in other cases, the best thing to do is to explore the different plays going on and read the reviews. TimeOut (theatre section) is a good page to be sure of that. You enter the Playhouse Theatre and some of the lines you read in George Orwell's novel come to your mind. You start thinking about the Big Brother, the opression, the political control and about how the world has changed. Then you sit down and the show starts. You lean forward on your seat and get ready to enjoy the play!!! A big screen at the top of the stage showing Winston's diary, where he writes his lines. His hands being filmed at the same time he writes 1984 on a piece of paper. Then all the lights turn off and the room where he was on his own becomes crowded...Then the Dystopia starts!!! The Big Brother controls everything. Each movement, each meeting, each word out of context but it doesn't stop Winston falling in love with Julia, a rebel who wants to DAMN THE BIG BROTHER!!! The impression of being in two different worlds, in two paralel realities gives you the sense of not being free, of being stuck in the same place all the time, an eye on your shoulder doesn't give up looking at you. A hectic reality, flashbacks, rebelions, repeated situations...all in one play. And GOOSE-BUMPS assured!!! The walls opening up (showing the reality behind them, the TRUTH maybe), the strong rebelion ( and Winston's torture are so powerful that your eyes will keep wide open without any doubt. So if you're one of those people who tend to fall asleep in the theatre, you'll not this time. 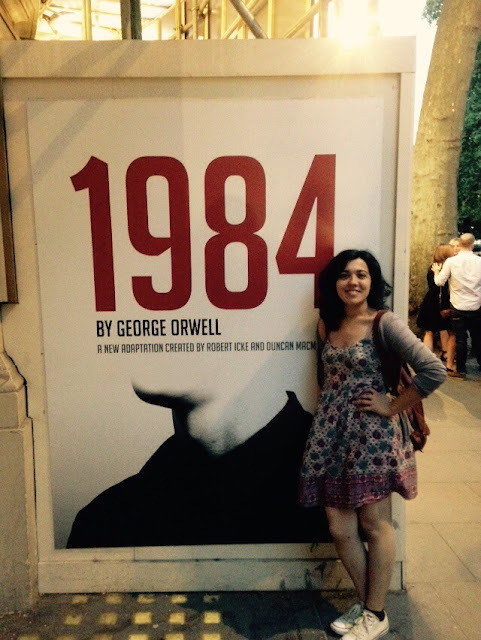 Robert Icke and Duncan Macmillan did a wonderful job by co-writing and directing this new version of 1984. The combination of playing on stage and in front of a camera which films some of the character's actions makes the audience experience the contradiction of what's real and what's not, let them think about how much the Media takes control in their/our lifes. Even a tender kiss taking place behind the stage wall can be filmed. WHERE IS THE PRIVACY THEN? Maybe there's no privacy any more in our lifes. Maybe we're being puppets in the middle of nowhere, being tortured unconsciously, being damaged without an explanation, being controled by the Big Eye. But MAYBE, we can change it!!! I didn't want to spoil the play by giving too much information, cause I think you have to experience it by yourselves. I only dare to give you some tips about what you should do in case you'd like to watch it!!! Go to the Playhouse Theatre and try to get cheap DAY TICKETS or RETURN TICKETS: this is, for sure, the best option. Go to the theatre about half an hour before the show starts and answer for day tickets, they are the best price ones. You'll not spend more than £15 if you succeed. And £15 for a west end show is more than worth it!!! The thing is, HOW DID I SUCCEED? Well, I got the tickets in a box office in Leicester Square, so that I spent a little bit more (£22), because I was not into this world yet. If I had known that I could have got day tickets I'd have saved £7. And here I am, after watching the play!!! More posts about other plays will come soon. Keep an eye on them!! !